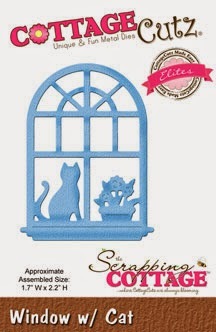 Cheryl here today, and I'm sharing a springtime card made for the Scrapping Cottage using the Darling New CottageCutz dies from the Spring Release found Here! and super fun to work with. I really enjoyed creating this springtime card using the super sweet CottageCutz Window w/Cat Die, Vine,Victorian Fence, and the Spring Treehouse, all CottageCutz Dies from the Spring Release. 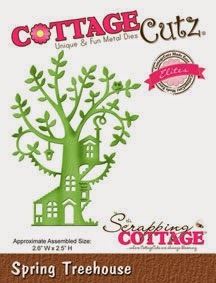 All CottageCutz Dies are linked to the Scrapping Cottage Store for easy findings. On my card I used some pretty Crate Paper Design paper I got from the Warehouse sale last year here in Utah. I layered it, and did some sewing on each layer. Next I airbrushed the clouds using a die cut for the outline. All the CottageCutz pieces were cut in white, and then colored using copic markers. I did add some half backed pearls to the CottageCutz Vine. 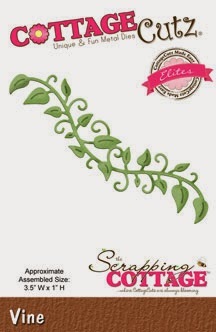 The border is CottageCutz Sweetheart Border, I love this border, its one of my many favorites from the Scrapping Cottage! All the wording are from the CottageCutz Expressions line. I used the MOM Expressions die, and the Thinking of you Expressions die,. I just colored them with copics to match my design. Thank you for looking and hope you have an AWESOME week! Beautiful view and beautiful spring card. Perfect. How beautiful. The combination of dies is awesome. Your work is always so special!